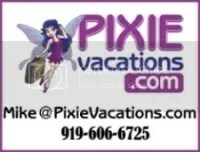 Friendship Friday -- My friends at Pixie Vacations! Hello everyone, and welcome to another edition of Friendship Friday! 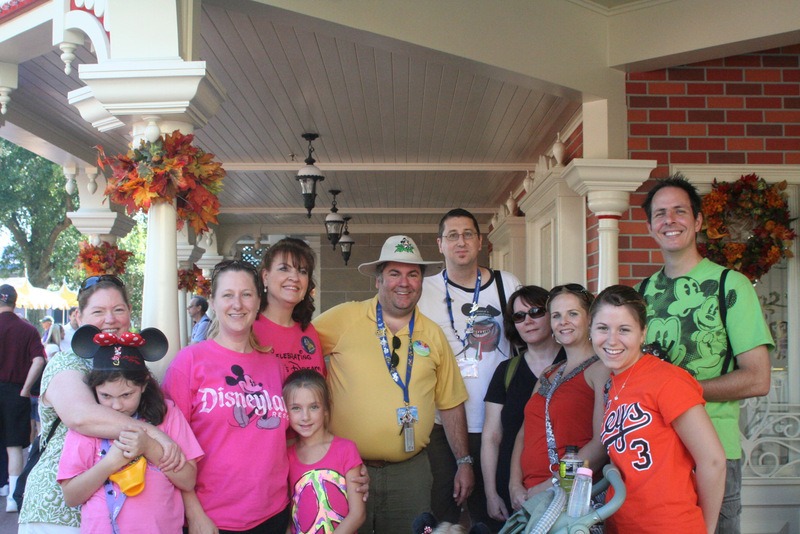 While I normally use this post as an opportunity to highlight a special friendship that I have with a friend or family member, today I am using my forum to shout out a group of friends and professionals in the Disney travel industry — my friends at Pixie Vacations! The picture that you see above was taken for the 40th Anniversary of Walt Disney World, on October 1, 2011, which Cindy, Sophie, my niece Stephanie, and I had the honor to be able to attend. On that day, we were able to meet up with some incredible people — some that I already knew through the blog, some that I knew through Chip and Company, and some that I only knew through the incredible MouseChat.net podcast. Looking at the left you see my wife Cindy and daughter Sophie, Lisa, one of the owners of Pixie Vacations, with one of her daughters; my Sister-In-Christ Brenda, me, my buddy Bob, one of the characters on the MouseChat.net Podcast and a Pixie Vacations Travel Agent, my friend Chris, another of the Pixie Vacations Travel Agents, and also on the MouseChat.net Podcast, my friend Natalie, another of the Pixie Vacations Travel Agents, my niece Stephanie, and Steve, who is married to Lisa and is the other owner of Pixie Vacations. I chose today to highlight this special group of people because I have a big announcement to make — at least, it is big to me, and Cindy and Sophie like it too — I have recently signed on to be a travel agent with Pixie Vacations! Let me tell you, since I started this, I have had an incredible amount of fun — and by the way, I started it on my birthday, February 6th, 2013 — but on top of that, I have met online even more incredible people then those that I’ve featured here today! When I was talking about this with Lisa, one of the biggest things I learned from her was that her agents are family to her, ‘Ohana, if you will, and that no matter what happened in the course of daily business, she expected her family to remember that, and to treat each other with the respect that we all deserve. At Pixie Vacations, we strive to help you have the most magical vacation you can — whether that be at Walt Disney World, Disneyland, or any of the other magical Disney destinations — or on a more traditional vacation path, also. We are here to help you; all of us at Pixie were people that planned our vacations for our families, and we loved it so much that it made sense to branch out and help other people plan their vacations also. So, what can I do for you today? If you would like my advice, help, and support in planning a Disney vacation, please feel free to reach out to me; you can get started by calling the number on the image below, or shooting me an email to Mike@PixieVacations.com. Thanks for stopping by, and reading about my friends at Pixie Vacations! Friendship Friday, as you all probably know by now, is the brainchild of my dear Disney friend Heidi from Heidi’s Head! Please click on the image below to learn who she has featured for today on her Friendship Friday post, and thanks for stopping by! Thanks, Terri! Have a great weekend! What a fun way to combine Friendship Friday with your announcement, Mike! Having done the travel agent thing for 6 months last year, I know that you will be an awesome agent. Your clients will LOVE YOU! Previous Post: Magical Blogorail Red – A Few of our favorite Disney Things!